Police in Avon and Somerset have created a cartoon, Car Thief Keith, in a bid to inform residents about car crime prevention. In a series of flash videos, Car Thief Keith attempts to break into cars. 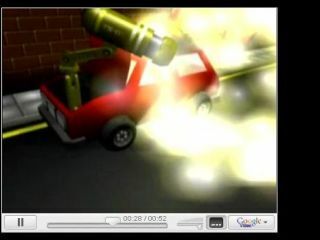 In one, he breaks the car window, only to be stopped in his tracks by a variety of weapons springing out of the boot. The videos will be available on the Avon and Somerset police website , as well as video sharing websites YouTube and Google Video . One new cartoon will be launched per week. Police are hoping this will help raise awareness of car crime. Under Operation Relentless, the force will reinforce the message to residents that if you don't leave property on display in your car there will be nothing for a thief to steal. Chief Superintendent John Long said: "This is about trying new ways of getting through to different audiences. Our standard ways of getting messages to the younger audiences just aren't working and we are still seeing hundreds of vehicles broken into across the force. "We are now trying different ways of getting this message across - if a light hearted cartoon is what it takes to get a serious message across, then that is what we will try," Long told the This is Bath website.